Saturday night, saw the Muskoka Anglers come to town to take on the Essa Stallions, which helped kick off the 2nd part of the season for Essa as they hope to make the stretch run to the playoffs. Unfortunately due to some winter rust, and some key injuries, this game saw the Stallions fall to a 5-1 defeat at the hands of Muskoka. Not only was the score board not in The Herd's favor, but they also lost a key player for what would seem to be the rest of the season. After Jeremy Fortin gave the Stallions a 1-0 lead early in the first period on a shot from the point that beat Anglers goaltender Ethan Messner, a harmless clearing attempt to an awkward area of the ice for goaltender Matthew Server, saw Anglers forward Keilan Cutting run Server, knocking him out of the game. Still awaiting medical results on Server, as he is scheduled to see specialists at the end of the week. It's believed to be a serious upper body injury, that would see him miss 6-8 weeks, prematurely ending his season. 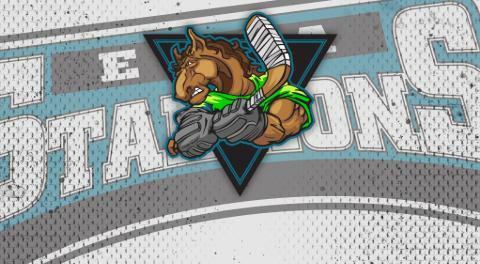 A few minutes later, while on the penalty kill in the 1st period, Stallions forward Dylan Beatty finished a check in the corner, resulting in a 5 min major for boarding and a game misconduct. Unfortunately the loss of Server would change the momentum of the game and prove to be an obstacle that could not be overcome. The rest of the way, the Stallions would outshoot the Anglers 55 to 16. Anglers goaltender Messner would go on to make 54 saves on the night, earning the games 1st star. Muskoka goals were scored by Tim Borse (2), Nathan Steele, Brett Machin and Cameron Murray. "We were rusty tonight. Long layoff for us, and it showed. Timing was off..bad bounces...passes into skates instead of on sticks...that's how hockey goes sometimes. Unfortunately that happened to us tonight, and the rest is history" said Head Coach Sylvain Cloutier. "We played well in spurts. Controlled the play for majority of the game, but unfortunately that's how it goes sometimes" Cloutier added. "We were undisciplined and those penalties hurt us". "When we were 5 on 5, we created chances. We had 55 shots on net, and honestly should have had 15-20 more. 3 posts, and missed the net a bunch. Can't score if you don't hit the net, no matter how easy/good of the chance there is" said GM & Assistant Coach David Lang. With the trade/acquisition deadline approaching (February 5th @ 6:00 p.m.), Essa hopes to add some more depth to make another run at the President's Cup. "I believe we have the team to go the distance again. We're always looking to improve. We know the other teams in the league are going to be adding, which means we can't sit put either. We will make a deal if it makes sense for us" said Cloutier & Lang. The Herd will get back to work this week, as they get ready to host the Smith Falls Settlers on Saturday night @ 7:30 at The Angus Rec Center. This will be a rematch of last years President Cup finals. See you at the Barn!